Do you find loose change when doing your laundry? If so, this Diy Loose Change jar would make a cute, and handy addition hanging in your laundry room for all the loose change collected from your washer and dryer. 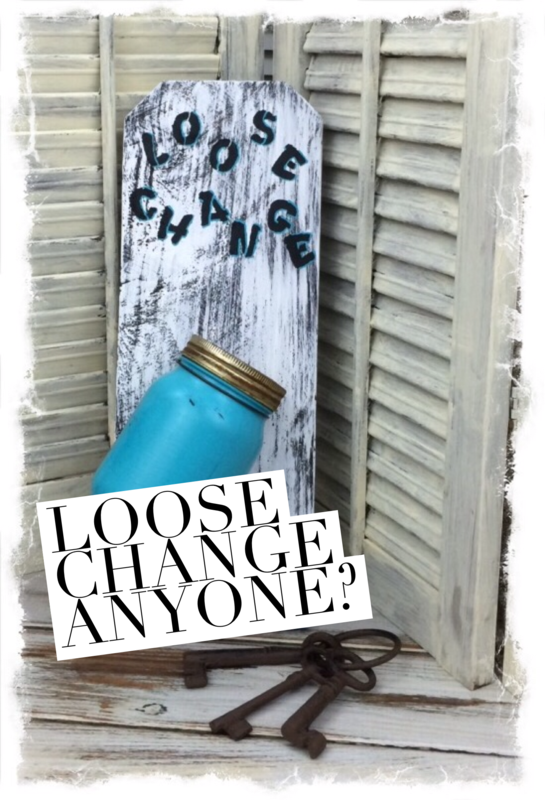 Continue reading to see how I made my diy loose change jar. 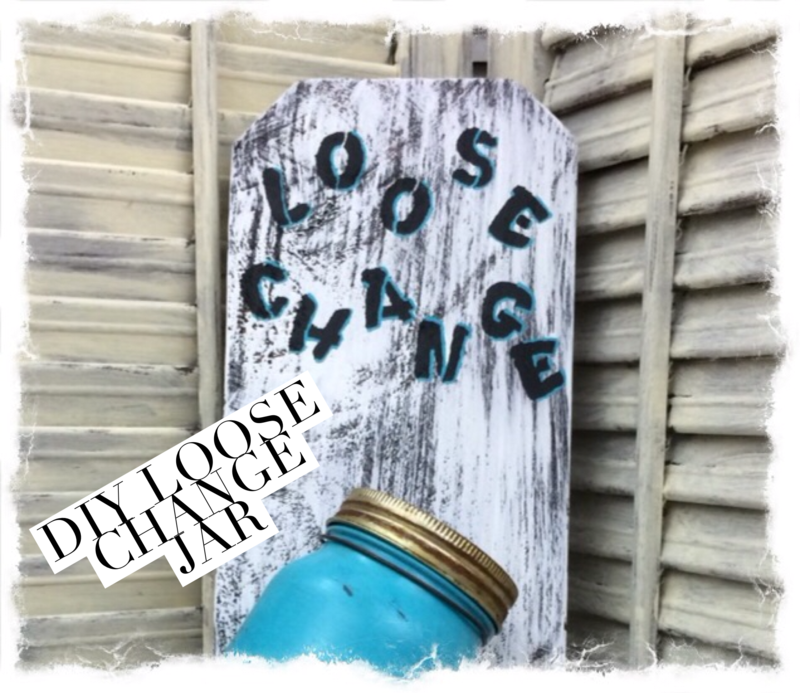 How to make a change jar for collecting loose change in the laundry room. Spray paint a Mason jar brown. Add 2-3 coats of turquoise colored acrylic paint to your Mason jar letting each coat dry throughly. Once Mason jar is completely dry take a piece of fine grit sandpaper and scuff it up a bit letting the brown undercoat show through. 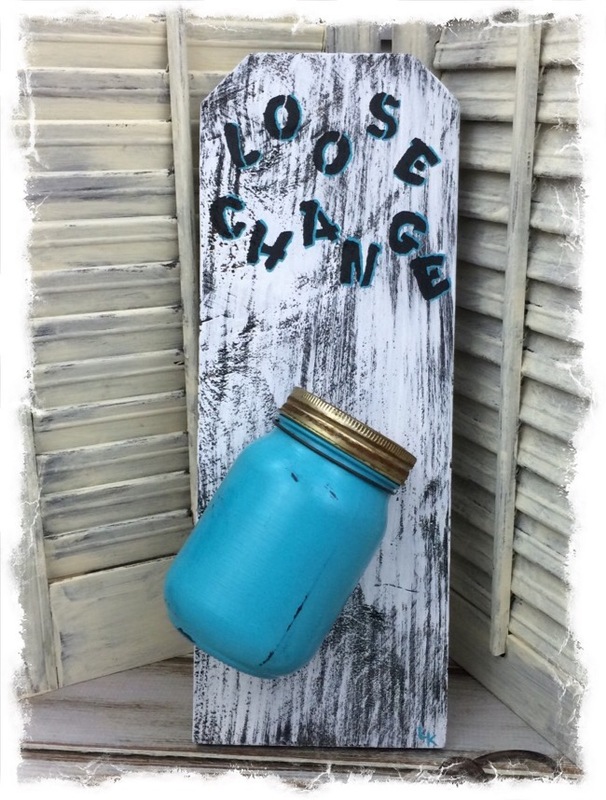 Seal Mason jar with Mod Podge. Add your aged Mason jar lid. First cut, sand, and stain a board approximately 15″ in lenght. Dry brush while acrylic paint over your stained board leaving some of the stain showing through. Once dry stencil your wording on. 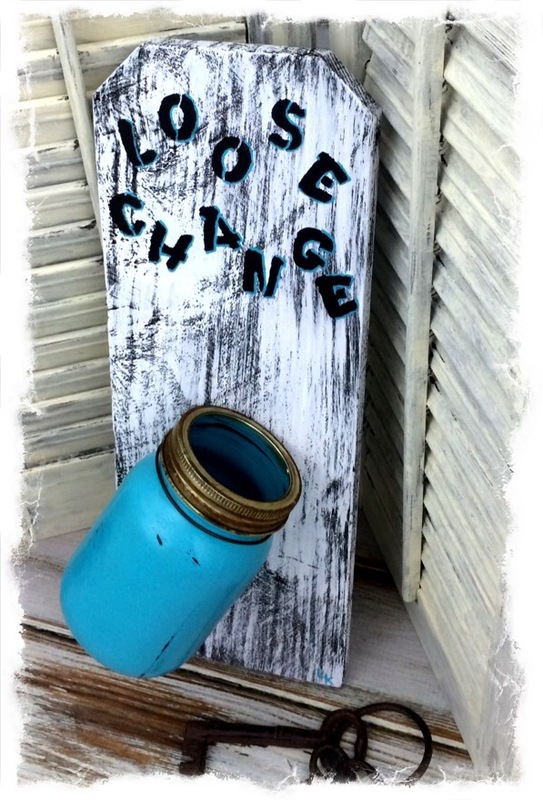 Add a little of turquoise paint to the edges of your letters to brighten them up. Drill two holes about 1 1/2″ apart in your wood where you want to attach your jar. Use wire to attach your jar to the wood. Attach a handmade wire hook for hanging. And there you have it. A cute loose change jar to hang in the laundry room to toss loose coins found when doing the laundry. Once full treat yourself to a nice dinner, or buy yourself something special. Linda, this is adorable. And a great idea, there always seems to be loose change flying around in our dryer. I hate that noise! LOL I was really intrigued with how you attached your jar to the Aged wood. What a great idea to wrap wire around the neck of the jar. I never would have thought of that. Makes it much easier to hang on the wall to drop in the Loose Change. Love it. Thank you Nikki! I don’t find a lot of change in my dryer I find bills, LOL. The hubby is bad about putting bills in his pockets instead of in his wallet, even this morning I found $5.OO. I have a big roll of wire, I use it a lot for attaching and hanging things. This is so cute. But than you know I do enjoy jar crafts. Thank you Debra! I do enjoy crafting with jars as well. Thanks for stopping by!